The classic Banshees album from 1981 has been digitally remastered from the original master tapes and contains three bonus tracks: "Spellbound (12" Version)", "Arabian Knights (12" Vocoder mix)" and "Fireworks (12" Nigel Gray Mix)". 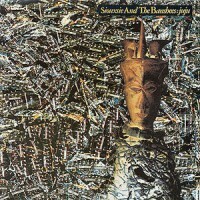 One of the band's masterworks, Juju sees Siouxsie and the Banshees operating in a squalid wall of sound dominated by tribal drums, swirling and piercing guitars, and Siouxsie Sioux's fractured art-attack vocals. If not for John McGeoch's marvelous high-pitched guitars, here as reminiscent of Joy Division as his own work in Magazine, the album would rank as the band's most gothic release. Album opener "Spellbound," one of the band's classics, ranks among their finest moments and bristles with storming energy. Mine says: If you're into post punk but not familiar with Siouxsie and the Banshees it is about time. Juju is a brilliant album from start to finish. Listen to it loud!